It's very exciting for us to feature the Karimi Sisters Art Work on Beatles Through The Years. The Karimi Sisters have a precocious talent for drawing and they've very kindly agreed to let me feature their art on this blog. First up by the sisters are two portraits of John Lennon. Shanti and Tabrizi Karimi are sisters who have travelled around a lot in their short lifetimes. Shanti is 17 years old and has an ambition to be join the FBI whereas Tabrizi has aspirations to become an actress but one thing they have in common is a love of art. Like the Beatles themselves they had no formal training in their craft. They were taught by their mother from a book and ever since they've been drawing whenever they can and these portraits of the Beatles are wonderful, I think you'll all agree! 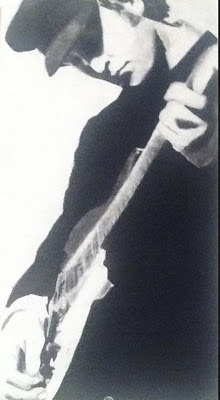 John Lennon by Shanti Karimi. 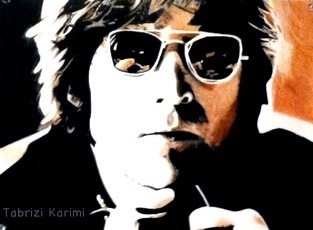 John Lennon by Tabrizi Karimi.